I arrived at the Frankfurt airport and immediately headed downstairs to the train station–Frankfurt Flughafen Fernbahnhof. Wow, that’s a mouthful! 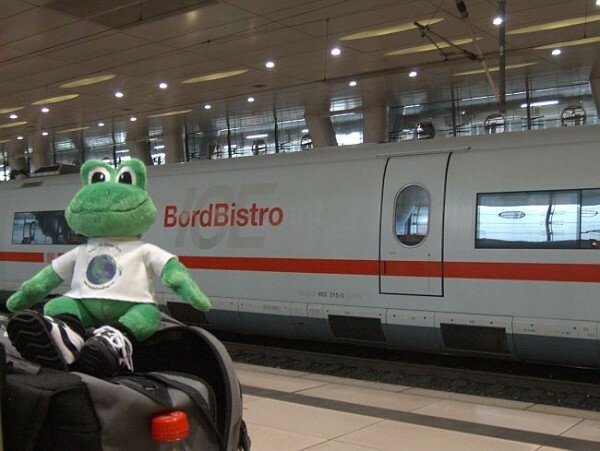 Here I am sitting in front of the dining car! Wow, that's fast! I had trouble holding the camera steady! 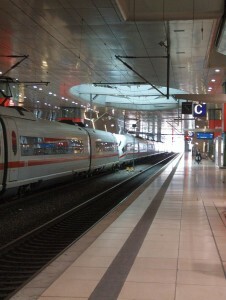 I found the Frankfurt train station to be extremely clean and efficient! 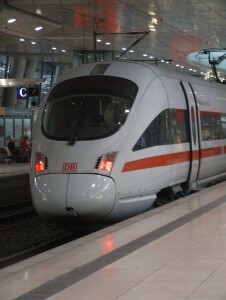 I bought a ticket to Kassel, which is located approximately 191 kilometers from Frankfurt. The train was fast! 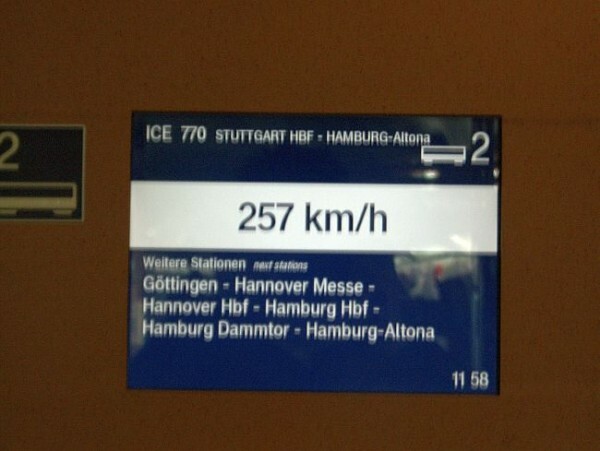 It went 260Km/h which equals about 160 mph and it took one hour and forty minutes to get there! The train station was VERY clean and easy to get around. I had a window seat and I enjoyed looking out the window as we sped down the tracks. Oh, I give up! That’s fast! What were you and Polly doing in Germany? Did Polly behave herself on the trip? Yeah, Polly #13 had a good time in Germany! She met Polly #40 and they both climbed up a large mountain together. You can see them in the picture. She also helped make famous German Christmas cookies! You mean nervous about the speed of the train? Did you eat one of the cookies? Tell Mrs. Schneider to bring one for me. Please! Thank you for posting the picture. It was a good picture! No, I wasn’t allowed to eat one, they told me I’d get a stomach ache, but let me tell you, the cookies smelled like they were from heaven. 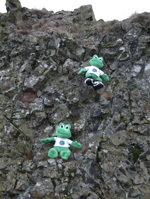 If you can tell me which frog is Polly #13 in the climbing mountain picture you will get an original German Christmas cookie! The one with the shoes is polly #13. You’ve earned your cookie! Hopefully you will like this German treat. 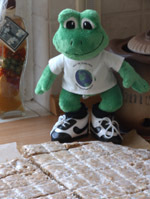 Thank you for the German cookies!